Our final port was 2 nights on the island of Kauai. 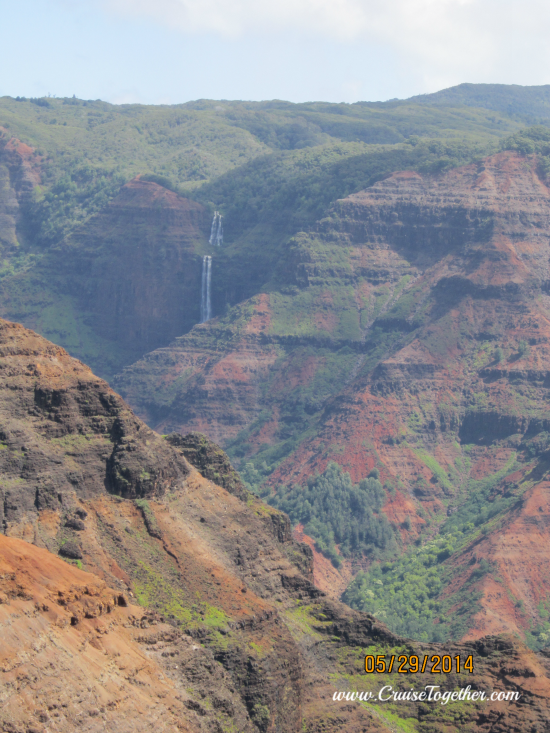 We took a tour to Waimea Canyon which is known as "the Grand Canyon of the Pacific". There were curvy roads going up with great views at the top. We were lucky the weather was good because we were told the day before it was too foggy to see. There was a guy dressed as a warrior with a mask made from a gourd with who one could get their picture made. 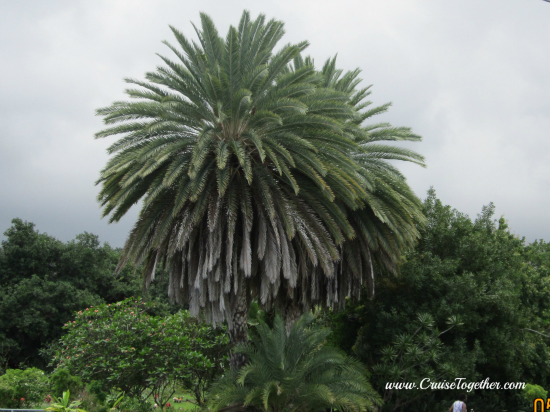 A coffee farm was our next stop with many coffee bean trees and we tasted several flavors of coffee. (I preferred the banana coffee). You may have heard or seen pictures of the "Spouting Horn". It is on the south shore of Kauai. The waves come in under the rock and produce a geyser. It is fun to watch. We rode along the Popiu shore with many nice beaches. This is a place I would like to come back and spend more time someday. and a very nice beach. As we left that afternoon on our ship we cruised the Na Pali Coast. Many movies have been made here because of the beauty. This was a great grand finale to our 7 day cruise! This was a fantastic vacation! Everything went very smoothly and we were able to see a lot on each island. 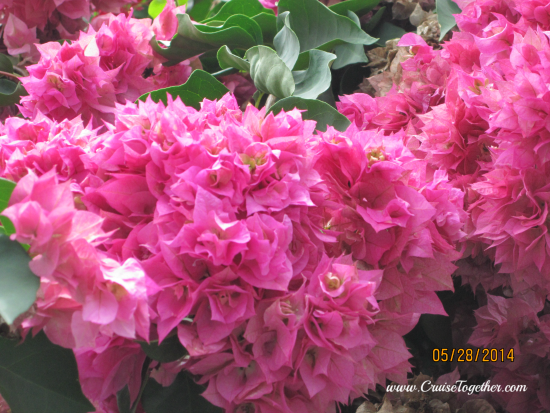 I would be very glad to help you plan your vacation to Hawaii. 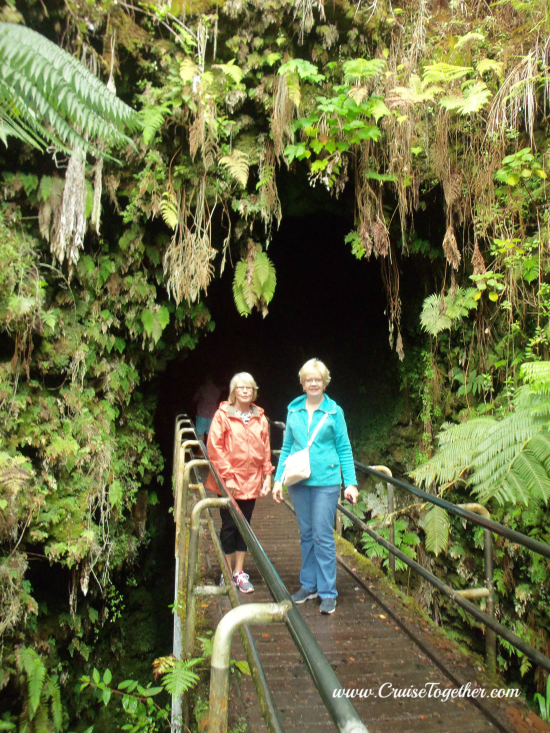 Contact me for more information on your Hawaii cruise as well as tour information - becki@cruisetogether.com or 336-922-1837. Our ship cruised to the opposite side of the island overnight and we docked near Kona for our second day on this island. 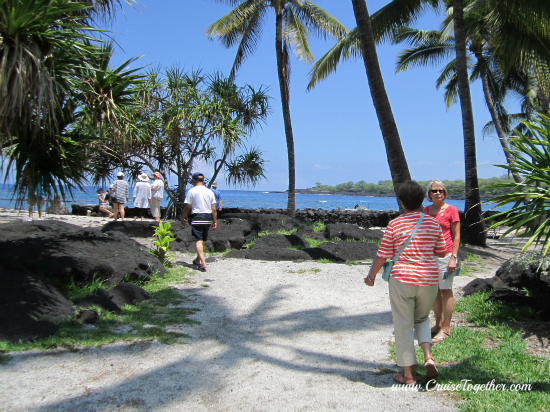 We took a historical tour which included Pu'uhonua 0 Honaunau National Park. It was very pretty here and we got to walk on lava rock into the ocean. 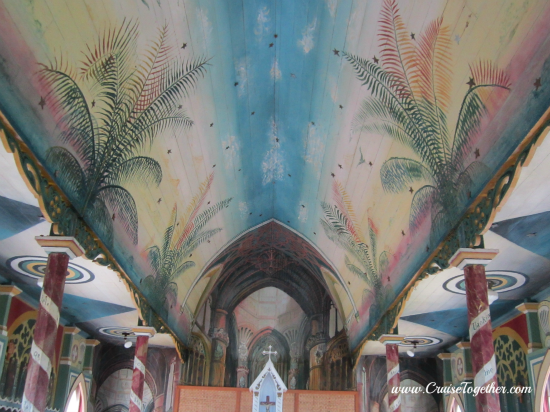 We then went to St. Benedicts Catholic Church which is also known as "the painted church". Everywhere we looked were beautiful trees and flowers. Another enjoyable day on the islands. Our show on the ship that evening was "Oh What a Night" with Frankie Valli and the Four Seasons songs. 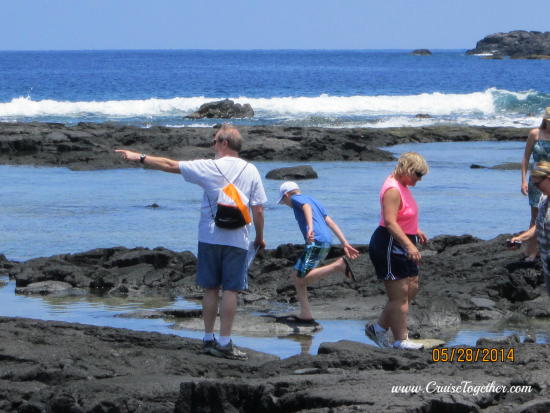 We cruised next to the island that is known as "The Big Island" and also "Hawaii". Our ship spent 2 days here with our first day near Hilo. You have a 50-50 chance of rain on any day. It did rain on us some but we had rain ponchos. 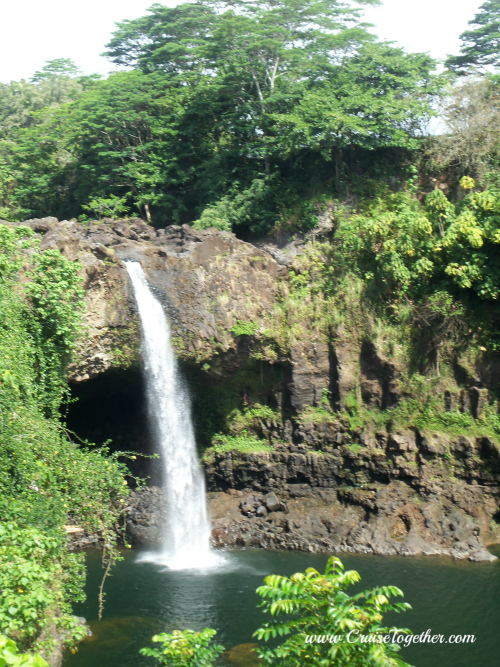 We took a full day tour stopping first at Rainbow Falls. 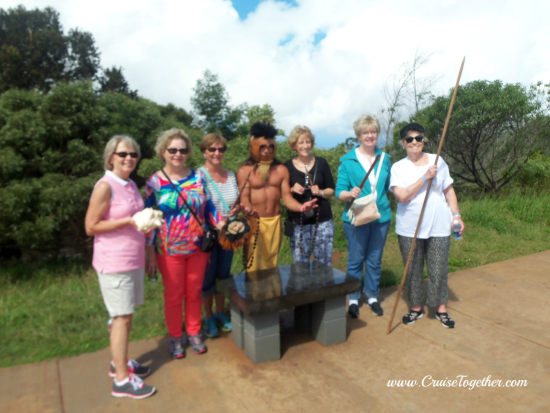 We then went to the big attraction of the day, Volcano National Park. 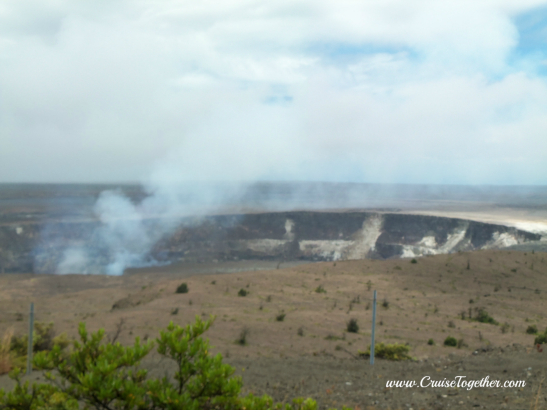 We saw a crater that had collapsed and the steam was still pouring out of it. 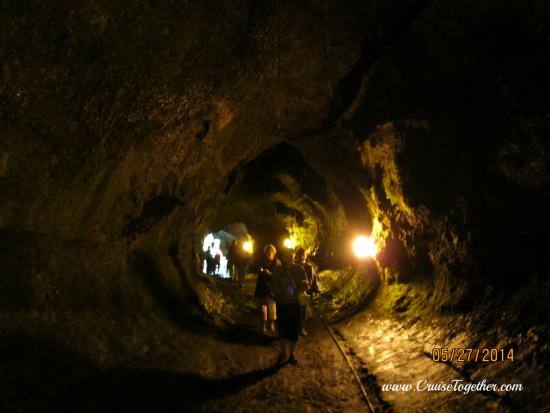 We also got to walk through a lava tube. How cool is that? We were not able to get close to flowing lava because it was considered too dangerous but it all depends on where it is flowing on any given day. 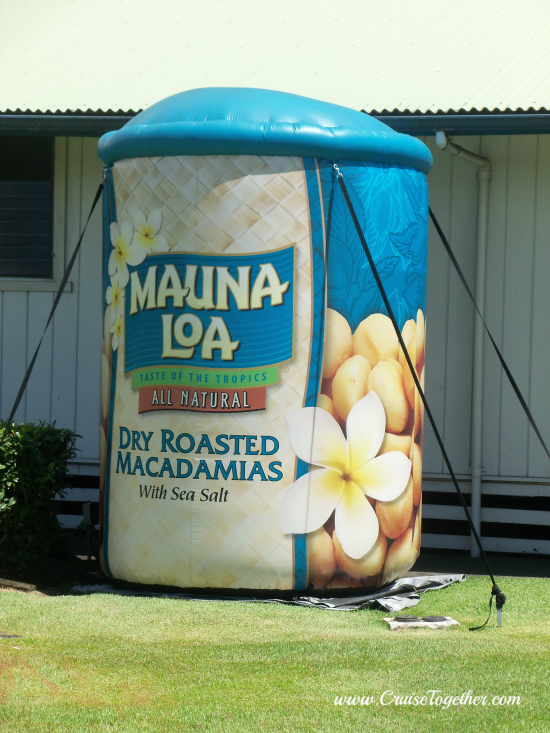 We also stopped at Mauna Loa factory where you will find every flavor of macadamia nut . And they all were good! After a full day we went back to our ship and ate at the Liberty restaurant which became our favorite place on the ship to eat. We then saw a comedian in the theater and the band Toby which was quite good.